It was an opportunity too good to miss and 10 young Kiwi riders accepted the challenge on Saturday night. Mt Smart Stadium in Penrose was packed almost to capacity for the inaugural S-X Open Auckland supercross on Saturday and while the more than 21,000 noisy race fans in attendance were thrilled to be there to witness the inimitable spectacle of international supercross action, it was perhaps the 10 young Kiwis who had signed up to accept the 2018 KTM Junior Supercross Challenge who expressed the most joy. 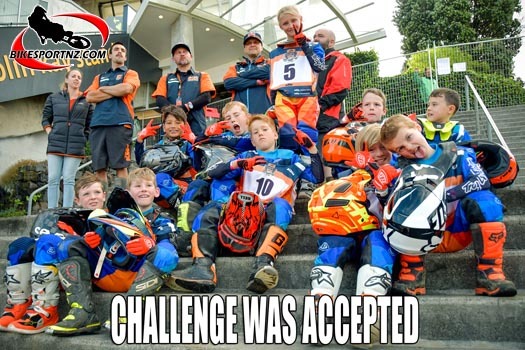 For the first time in New Zealand, KTM was able to offer the KTM Junior Supercross Challenge (KJSC), a unique opportunity for aspiring young riders to experience the life of a professional supercross rider for a day. They were each provided with a factory-prepared KTM 50 SX bike for the day, equipped with KTM PowerParts. The riders were given a KTM PowerWear Pack to keep, which included Troy Lee Designs jersey, pants and gloves. KTM Replica Teamwear t-shirt and hat for both the rider and their designated mechanic were also supplied. Riders were treated to an extended practice session on the supercross track and one exhibition race, each outing cheered on by the appreciative crowd. Each of the riders who applied for this experience had to meet strict criteria: They had to have at least 12 months’ racing experience; they had to be between the ages of seven and eight; they had to meet certain weight and height requirements, for safety reasons, and also had to provide a school report card that showed they were good students. 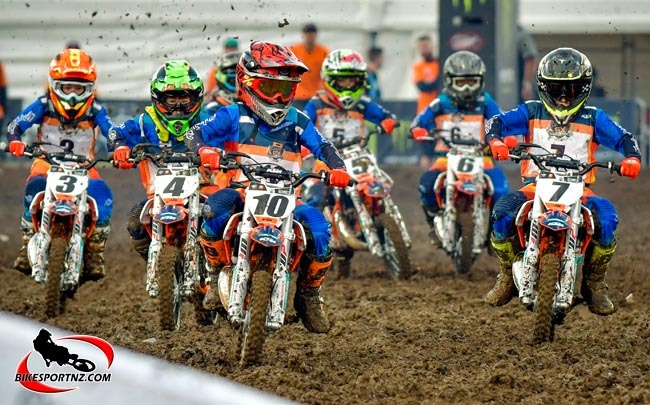 “Having a good school report was a very important factor,” said KTM events co-ordinator Kyle Blunden. Although, it’s probably fair to say, school work was probably the last thing on the minds of these young riders on Saturday. “Looking through images from the night, we can see everyone was really caught up in the experience and they loved every minute,” said Blunden. “For these young riders to go out and ride on this track in front of such a large crowd is something they will no doubt remember forever. Dungey is one of the many who credit KJSC for his introduction to top level supercross racing and he went on to win the US Supercross Championships as a 250cc rider in 2009, before winning the 450cc title four times for KTM, in 2010, 2015, 2016 and 2017. He retired at the top, hanging up his helmet at the end of the 2017 season. American KTM rider Dakota Alix won the senior SX2 (250cc) class on Saturday night, finishing ahead of fellow KTM rider Ryan Marmont, from Australia, with Mount Maunganui’s Josiah Natzke (honda) completing the SX2 podium. Australian Chad Reed (Suzuki) won the SX1 class at Mt Smart Stadium, ahead of Australia’s Hayden Mellross (Husqvarna) and Scotland’s Dean Wilson (Husqvarna).